Christy Rupp is a multi-media artist deeply committed to the well-being of our environment. She created a short animation about the Gulf Oil Spill entitled Macondo Blowout. Neal Hollinger Animation Test from Flick Book Studio on Vimeo. Artist Neal Hollinger came in for 2 days to experiment. He brought a drop-dead gorgeous, surreal set made of insulation foam for the landscape. His friend Kieren brought a wooden puppet head. They used colored sand to soften the edges and also to animate, as well as some clay pieces. The Gardening Bug from Flick Book Studio on Vimeo. My first collaboration of 2013 is with Jacinta Bunnell and Ken Greene. Jacinta is an assistant teacher at High Meadow School in Stone Ridge, New York, and is one of the founders of the Hudson Valley Broads’ Regional Arm Wrestling League (BRAWL). She is also the author of three coloring books: Girls will be Boys will be Girls, Sometimes a Spoon Runs Away with Another Spoon, and Girls Are Not Chicks. Ken is the co-founder of the Hudson Valley Seed Library, a seed house of open-pollinated, mainly heirloom seeds. Sunday, July 1, 2012 from Flick Book Studio on Vimeo. In July, I invited my friend Wayne Montecalvo, a multi-media artist and musician based in Rosendale, New York, and Anne Gorrick, a poet based in Kingston, New York, to come into the studio and collaborate on an animation. It was my first time to meet Anne, though we had been Facebook friends. It was a purely experimental and improvisational project, with no expectation or plans. Animation was a great neutral ground which none of us was using as the major medium. I asked them to bring any objects they may want to use. 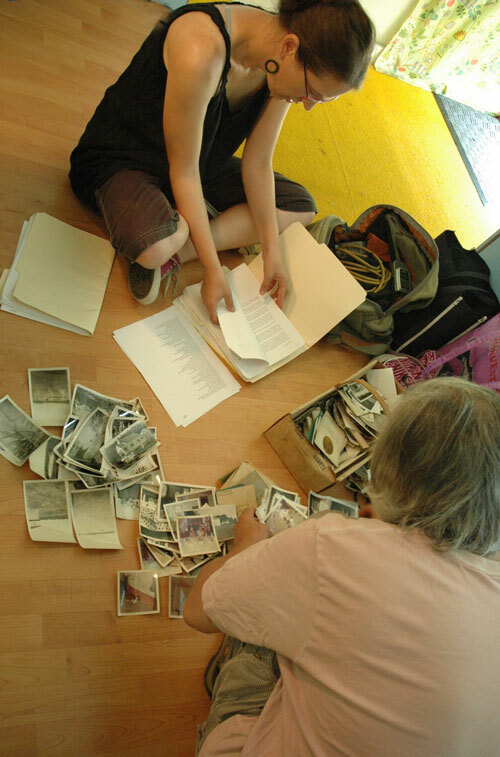 Wayne brought stacks of vintage photos he borrowed from a friend; Anne brought pages of her poems. 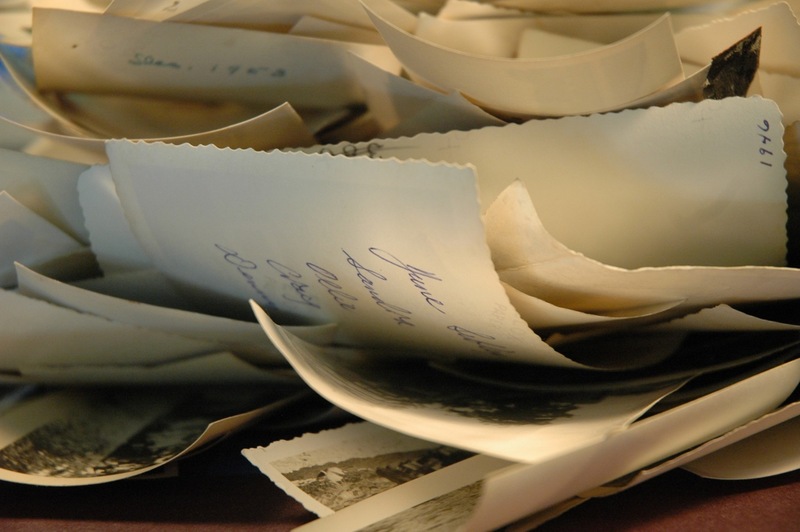 We began by playing around with the photos, gradually agreeing on tossing them into a pile while recording on time-lapse. We experimented with varying paces and angles; sorted and unsorted images; tried different tossing techniques. Once we had a footage we liked, we recorded voice-overs on Wayne’s Zoom mic. We randomly read a sentence at a time from Anne’s poems. Wayne and myself, not familiar with Anne’s poems, or—in my case—working with spoken words, period, we were awkward at first. But in several takes, we got into a grove, and after a certain take, we all looked at each other and knew that it was a keeper. How did we know that? Hard to tell. We enjoyed feeling that it was good without knowing why. We started at 10 in the morning and by 5 we had a finished video. We all added it to our portfolios and websites, where it will be available at the click of a mouse. We encourage artists and creative people in all fields to give this idea a try. It is like going back to where it all started, making art for pure pleasure, with all your knowledge and experiences intact. We ask that you take either of our One Day Intensives or Intro Course first (unless you know how to use all of our hardware and software), then you can use our studio for $20 per day to work on your own or with friends, or if you need assistance, in project-based sessions. Sea Glass from Flick Book Studio on Vimeo. Experimental clip made with Mimi Goese and Karin H. during our One Day Animation Intensive. We had our first workshops with adult artists this weekend. On Saturday, we made several clips interpreting the element water, in the first of the Elements series. We had three objectives in this workshop. First was purely artistic, to create engaging clips and experiment with textures and techniques. Second, we wanted to experiment with a group dynamic that we hadn’t experienced before, of parents and children working together in a group. The third objective was practical and social. We wanted to build a connection with another creative hotspot in the neighborhood, FiberFlame. Christina and Shea, the FiberFlame team, generously and enthusiastically lent us their materials to use for this workshop. Visiting their studio is a visual extravaganza. They picked fabric squares, beads, mosaic tiles, ribbons, paper, marbles, yarn, all in the shades of blue and mouthwatering aqua. They cut my task in half—collaboration makes life easier. Since we are so close to each other, it makes sense to coordinate our efforts together to attract visitors from areas outside of Woodstock and Saugerties. Plans in the making are: interchangeable sibling discounts; joint classes; movie nights. It feels very good to be in the community of creative people. [singlepic id=31 w=320 h=240 float=none]What would work for water animation…?